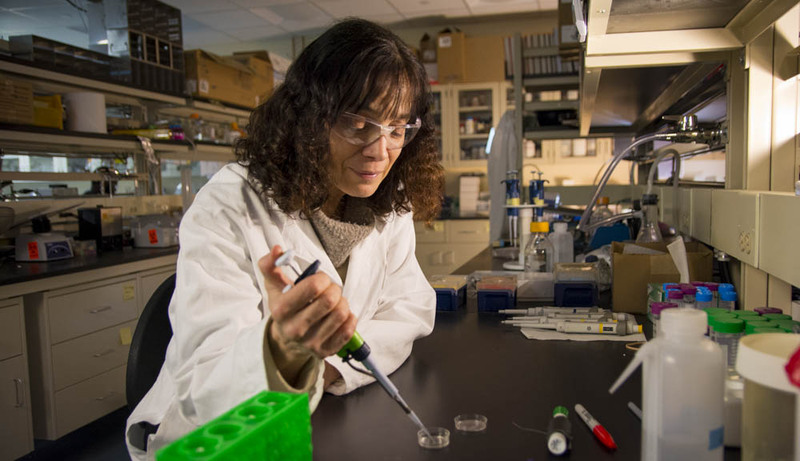 Suzanne Scarlata, a chemistry and biochemistry professor, knows that funding for scientific research leads to breakthrough research, discoveries, and therapies that will change lives. Suzanne Scarlata’s passion for learning how cells work led her to investigate cells and how they react to their surroundings. Knowing this information can lead to better therapies for disease. I’ve always been fascinated by the way that cells grow, move, or die depending on their environment. I feel that understanding how cells work would give clues into the basis of different diseases. On TV, scientists work in beautiful labs full of reagents and state-of-the-art instruments. This is far from reality. I think that people don’t appreciate how difficult it is to do science. Federal funding is at an all-time low which is driving many people–especially young scientists–out of scientific research. If the US is to stay competitive, we need to support science. Watching cells under a high-resolution microscope exhibiting novel behavior. I hope our work will give a better understanding of how cells respond to their environment that might eventually lead to new therapies. How has WPI helped you prepare students to become an #ActualLivingScientist? WPI is unique in supporting undergraduates to carry out scientific research through their Major Qualifying Project (MQP), and it has been fun to have students in the lab and watch them discovering new things.